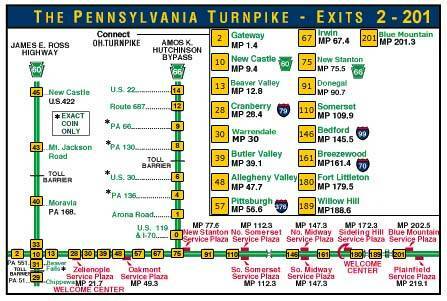 Here is a simple PA Turnpike Map with numbered exits and two additional maps to show exit locations. Everything is laid out to get a quick and easy reference to enjoy your Pennsylvania experience. Nothing is more frustrating than planning a trip through any state and wading through link after link of maps on the internet and discovering you have more links to wade through. Well, I've done all the wading for you. If you need a different type of Pennsylvania State Map follow this link and you'll find just about any type of map or a link to the type of Pennsylvania Map you are looking for. 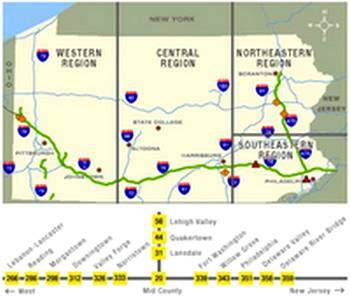 Here is a link to an easy to read Pennsylvania Road Map . And if you're wondering how to find a certain county here is a link to an easy to read Pennsylvania County Map. 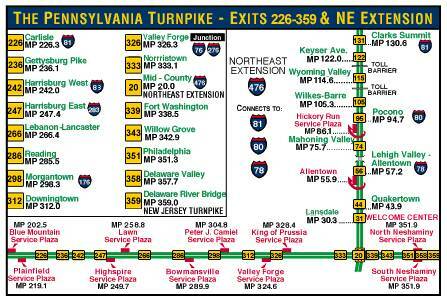 Here are a couple of handy Pennsylvania Turnpike Exit graphs. Even though all the exits on the Pennsylvania Turnpike is clearly marked, it always helps take a look at the exit numbers and know exactly what Pennsylvania City or town you'll be exiting at before you leave for your trip.